Quality crafted memorials stand the test of time. They tell a story, and provide a focal point for honoring the deceased. At our funeral home, we offer a full line of memorial products. Select a simple granite marker, an elaborately sculpted monument or anything in between. We'll help you find the right memorial to permanently acknowledge the unique life of your loved one. Monuments, Markers and other memorials designate a physical place where current and future generations can go to pay their respects. 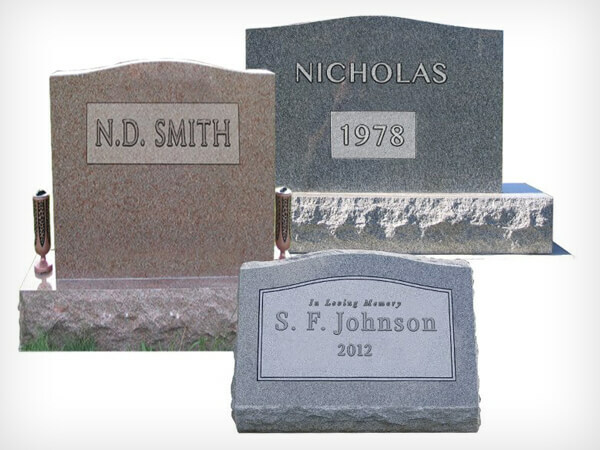 We can help you choose from sculpted memorials, granite markers, garden markers, memorial benches, tree plaques and more. Many one-of-a-kind designs are available. Because we strive to make each and every service meaningful and personalized to honor the memory of your loved one, we follow this same approach when designing a permanent memorial that will forever mark the final resting place of one so dear to you. Utilizing our years of experience in identifying quality and value, we have partnered with Murphy Granite, a highly respected granite supplier to offer a large selection of markers and monuments in many colors and designs. We offer permanent memorials for all budgets and all price ranges and include lettering, dates, carvings, foundation, delivery and installation. We also offer you the opportunity to view a computer-generated rendition of your marker or monument absolutely free of charge. We do this to ensure the accuracy of your memorial while allowing you to see the design for your total satisfaction with every detail. Finally, a written warranty provides peace of mind on your selection for future generations. We specialize in working with families to create permanent and very unique memorials for families. We encourage families to design and draw their own, or to work with an artist to create a truly personal lasting tribute. Choosing a memorial is a very personal decision. In making this decision, you should feel secure that your need for quality, variety, value and price are fully addressed. To learn more about the wonderful products that our two permanent memorial partners provide for families, please take the time to visit their websites by clicking on the banner links above.